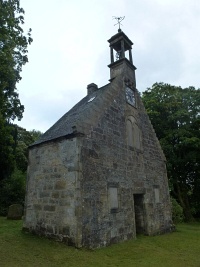 Only one bay of this church survives, dated 1729. The square, open-sided bellcote on top of the gable was restored by Honeyman, Keppie & Mackintosh in 1913–14. Alternative names: Auld Simon, Old Simon, St John's Church, St Winnoc's Church, St Winnock's Church.